Preheat your Yoder Smokers YS640 to 200ºF, set up for indirect grilling/smoking, with the Charcoal Companion Himalayan Salt Plate on the grill. The salt block must be heated slowly, or it can crack. Once your cooker reaches 200ºF give it 10 minutes, then increase the temperature to 250ºF. Continue to increase the temperature of the cooker in 50ºF increments every 15 minutes until you reach 400ºF. If not using a salt block, and cooking directly on the grates, simply heat your cooker to 400ºF. 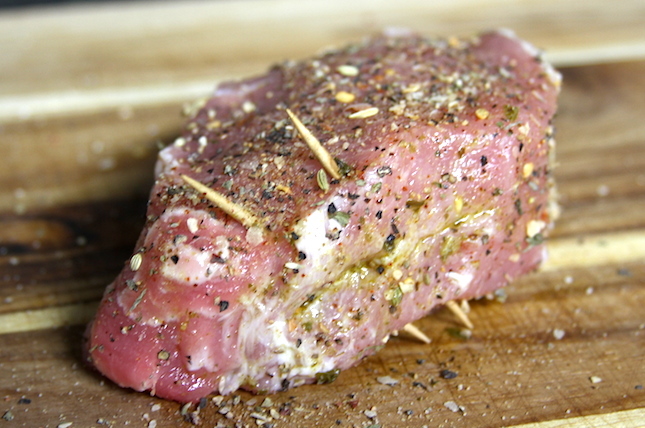 Slice a pocket in the pork chop, coming in from the side halfway between the top and bottom. Mix your stuffing ingredients in a small bowl. Divide the stuffing between the two chops. Push the filling through the slit you made to create the pocket. If your slit is long enough that you're worried about losing the filling while it cooks you can use a toothpick to hold the chop together. 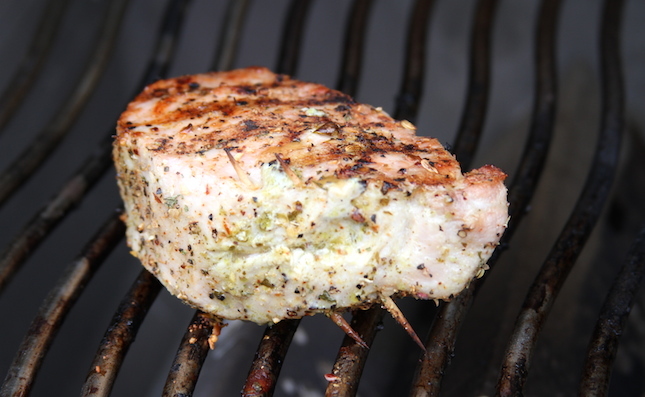 Lightly dust the outsides of the chops with Cattleman's Grill Italiano Seasoning. Let sit, refrigerated, for 15 minutes. 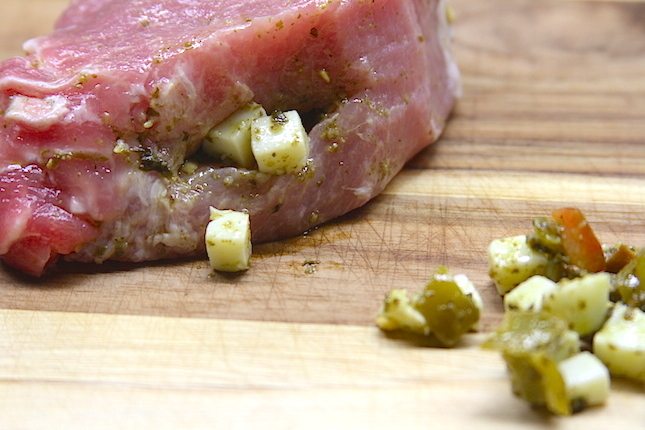 Place the chops on the preheated salt block on the grill. Cook the first side until nicely browned, then flip to brown the other, roughly 10 minutes each. The amount of time depends on how hot your salt block is. Watch the color, not the clock. Check the internal temperature. If the temperature has not yet reached 145ºF, move the chops to an indirect grilling position, where they won't burn and continue cooking until an internal temperature of 145ºF is reached. Pull the meat, cover and rest it 10 minutes before serving.